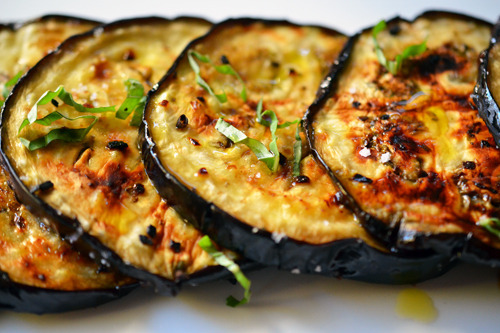 Eggplant are a delicious and abundant vegetable that you either love or can’t stand. We have a very simple and light recipe that anyone can make! 2. Cut each eggplant into 1/4-inch slices. Place eggplants, on a baking sheet lined with parchment paper. Brush 1 1/2 tablespoons oil evenly over eggplant slices. Bake at 450° for 15 minutes; remove from oven. Brush eggplants with 1 1/2 teaspoons oil; sprinkle evenly with salt and pepper. Bake an additional 10 minutes or until flesh is tender and edges are browned and slightly crisp. 3. Drizzle remaining 1 1/2 teaspoons oil evenly over eggplants; sprinkle with herbs.